I have been reading a few pages of this book for a week here and there, but yesterday afternoon at around page 30 it grabbed me and didn’t let go until I finished it around 3:00 a.m. this morning. The Cabin at the End of the World stands alone as one of the most gripping, suspenseful, and emotionally-charged novels I’ve read in quite a while. Characterizations were all spot-on, the plot twists and surprises were startling, the tone was steady without being contrived, and the story, told from different characters’ points of view, was as unique as it was terrifying. It’s not a spoiler to tell you that yes, it’s a home invasion tale. It’s also a thriller. It’s also a thought-provoking theological mystery. And to add to all of that, it’s also a story of family. 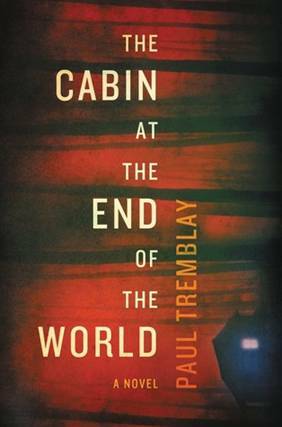 I’m no stranger to Paul Tremblay’s work and with no reservations, The Cabin at the End of the World is his finest to date. The dude just keeps getting better. The lone problem I had with this book was the forced inclusion of every politically-correct stereotype you can possibly imagine with the exception of a Brazilian transvestite named Shorty who was a used-car salesman next to a Korean nail salon above a bakery owned by two lesbians who refused to bake wedding cakes for white asexual homophobes with platted hair. But please don’t let that little bit of humor throw you off the book—yeah, it does its level best to be all-inclusive, but it’s still a scary ride.